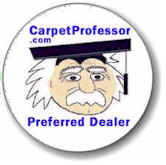 "You must choose the right carpet pad if you want your new carpet to last.. Here's what you need to know about choosing the best carpet padding for your home!" Carpet Padding - It's not all created equal! There are many different types of carpet padding available today in order to accommodate all the various carpet types and styles. Lets discuss the various types of pad that you will encounter when shopping for new carpeting your home, office or rental property. What is the Best Carpet Padding Thickness? A certain padding type, thickness and density is required by every carpet manufacturer to maintain your carpet warranty. For most residential carpets, a 7/16" thickness is most common and either a 6-pound density or an 8-pound density will be recommended. Berber styles may require a special padding with higher density and thickness of 1/4" to 3/8". Don't make the mistake of thinking that a thicker pad is a better pad. If you chose a padding that is too thick it can cause wrinkles to develop in your carpet over time. In most homes 7/16" is the thickest padding you would want to select to keep the carpet warranty in force, although many dealers still offer a 1/2" padding. What is the Best Carpet Padding Density? Padding is also rated by its density. Some pads have a low density rating of 3 or 4 pounds and are typically used in apartments because it is less expensive and will be replaced more frequently. Looped Berber styles and commercial grade carpets require a special padding and you should call the manufacturer to get the correct padding requirements needed to keep from voiding your carpet warranty. Most carpet padding used in residential applications has a density rating of 6 to 8 pounds, but other densities are available including 10-pound density. Some pads are rated in ounces instead of pounds. This is mainly true with Rubber Waffle Pads, Rubber Slab and Wool Felt or Synthetic Fiber Pads. For example, a 128-ounce Rubber Waffle Padding is the equivalent of an 8-pound Rebond Pad. Some homeowners prefer to use a 6-pound density padding because it is softer underfoot. However, an 8-pound padding provides better support for your carpet and will generally make it wear longer, especially in high traffic areas like stairs and hallways. The higher the density rating the more firm the feel is underfoot. The higher the density rating, the firmer the padding will be. Firmer pads provide better the support for your carpet. Better support means a lower chance for wrinkles to form over time. The higher the padding density, the more costly the pad will be. Do not expect the carpet salesperson to choose the correct pad for you, it is your responsibility to make sure the correct pad is selected and installed. If the wrong type, thickness or density pad is used, your carpet may develop wrinkles which is costly to fix and can significantly decrease the life span of your carpet. You can always contact the carpet manufacturer to find out what type of padding they recommend. Rebond pad is most commonly used in the residential setting. It is made from recycled materials, mainly from recycled urethane foam and is multicolored. It is available everywhere, and in almost every thickness and density. Rebond is the most economical padding choice for your home, rental or office, and it does a good job of supporting your carpet if you choose the specifications wisely. Not all rebond padding is high grade or is top-quality. Every padding manufacturer offers several grades of Rebond padding to their distributors. Retailers have a choice of which grade of rebond padding to offer to their customers. The main difference will be the type of recycled materials used to manufacture the padding. The higher the quality of recycled materials used, the better the rebond pad will be. Reputable carpet dealers always offer top-quality rebond padding to their customers. The price you pay for a good quality padding may be slightly higher than at the shady discount carpet store down the street, however you should never skimp when it comes to buying a good-quality padding to go under your good-quality carpet. The higher the carpet quality, the higher your pad quality should be also. The Grade of Padding you select must MATCH the Grade of Carpet you select. If you buy a carpet designed to last 15 years, then you must buy a padding that is designed to last at least 15 years. The question is, how will you know what grade of carpet or padding you are buying? Typical Cost for a 6 to 8-pound density Rebond pad is about $3.50 - $5.50 per square yard or about 39 to 45 cents per square foot. The higher the density rating. the higher the cost. All specifications being equal, what makes a pad worth $2 to $4 more per square yard than a standard Rebond pad? Assuming the specifications are similar... It is usually due to a popular brand or maybe just a higher profit margin at the dealer where you are shopping! This type of carpet pad is very inexpensive and lightweight. If a retail store tries to give you free pad with your carpet purchase, this is usually what they plan to give you. This type of padding will not tolerate much foot traffic. It will soon become completely flat as a pancake after a year or two and is not a good choice for a residential setting. This type of padding is often used in apartment settings where the carpet life span is less than 3 years. This pad comes in 40-yard rolls with a low density rating of 2 to 4 pounds and is so lightweight that a young child can easily lift the entire roll. Not made of recycled materials, this type of pad is called prime or virgin urethane. It's a much better grade of foam pad (frothed foam) that could be a good choice for the home. It is made of very dense urethane (polyurethane). It is designed primarily for commercial applications, but is becoming more common in residential applications. The cost more than a standard rebond and not a common choice among homeowners. Select a 6 to 8 pound density and no more than 1/2" thick. Memory foam is constructed mainly from polyurethane and it is often referred to as visco-elastic polyurethane foam. This is a relatively new type of padding on the market and is generally more costly than other standard foam or rubber padding choices. Memory foam padding has the unique ability to gradually return its original thickness after being compressed. As memory foam ages and wears, it tends to lose some of its memory resulting in reduced support for the carpet. Unlike other types of padding that have a spring to it, memory foam does not spring back quickly when walked upon. Unfortunately there is a limit to how many times memory foam will return to its fully inflated condition and may eventually end up laying completely flat on the floor. This is of special concern for main walkways and stairs. Memory foam padding can be temperature sensitive too, being firmer in cool temperatures and softer in warmer temperatures. Life span of memory foam padding varies due to the application and density rating of the type and quality of the memory foam padding selected. Personally, I do not usually recommend memory foam padding and prefer using a good-quality Rebond padding for most residential applications. Natural wool or synthetic padding is used primarily for Berber styles and commercial-grade carpets. They are very dense, breathe well, and are not spongy at all. They are made from recycled or shredded fabrics or natural wool. They are designed to fully support and allow looped Berbers and commercial carpets to wear very well in heavy traffic situations, and to prevent these types of carpets from stretching out and developing wrinkles. A Synthetic Fiber pad is also a great choice for basements with concrete floors as it breathes well, resists mold and mildew and has anti-microbial properties. I seldom recommend using a rubber waffle carpet pad in residential applications. Rebond pad is a much more economical choice and it does a great job at supporting your carpet as long the correct thickness and density is selected. Rubber slab padding is often used in commercial applications over concrete. Specialty Carpet Pads: Moisture barrier pad, odor eating pad, pet odor and baking soda infused pad. Some carpet salespeople may try to convince you to upgrade your order with a specialty carpet pad that has claims of being able to eliminate odors or claim to have a moisture barrier surface that will help reduce negative effects from pet accidents. I don't generally recommend these type of carpet pads and suggest you avoid the extra expense. I believe it will just cost you more money and not solve or diminish your pet accident problems for long. If you have a pet accident problem, there is no padding on the market today that I know of, that will solve your problem. Spending more money on a specialty pad will not significantly reduce the severity of your pet urine problem, nor will it help you with the cleaning of your carpet in the long run. Don't Assume an Expensive Specialty Pad Can Solve All Your Pet Urine Problems! If you have a serious pet accident problem, if so, upgrading to a more expensive carpet pad will not help you solve your problem. It won't make it easier to clean your carpet or reduce the severity of your pet urine problem. If you have a moisture problem in your basement, no "moisture barrier" padding is going to protect you from the dangers of mold and mildew forming under your carpet and padding. Many carpet salespeople try to encourage homeowners to spend more to purchase a padding that has a moisture barrier they claim will help solve some common issues. Don't be fooled into thinking that spending more money on a specialty pad will solve your pet or moisture problems, it just doesn't work that way. You need to address your problems first and then I recommend you select a good quality pad that is designed to properly support your carpet and meet your needs and goals. If you have water leaking in your basement, or evaporating up through your concrete slab, or if you have standing water in your crawlspace underneath your home, you must fix the problem before buy and install new carpet and pad. This may mean you may need to call in a company that can find and correct the moisture problem before you install new carpet or flooring. Here is a useful link to help you address, diagnose and hopefully solve your moisture problems. What is a Specialty Carpet Padding? These physically enhanced types of carpet padding are typically much more costly than a standard Rebond type carpet padding. Specialty pads claim to offer unique benefits for certain applications, but in most cases I do not believe any of these Specialty Pads are a wise or necessary choice for most homeowners. I have not found that there is a way for homeowners to effectively determine if a specialty pad is able to providing a cost-effective or worthwhile benefit, regardless of what salespeople or padding manufacturers might claim.